Monmouth Park Racetrack, Oceanport : Get Ready for Opening Day May 4th! Monmouth Park Racetrack - Get Ready for Opening Day May 4th! Celebrate Opening Day with live racing, Family Fun Day, live music and much more! Riders Up! May 4 is the kick-off to an exciting season with the Jersey Shore’s Biggest Kentucky Derby Party at Monmouth Park! Join Monmouth Park for Opening Day and the Run for the Roses on Saturday, May 4. It’s been 237 days since you’ve enjoyed the excitement and thrill of Monmouth Park! Don’t miss out on all of the fun Opening Day has to offer! Celebrate Derby with Mint Juleps, Derby hats, and more! Dress to impress to win our Best Derby Hat or Best Dressed Couple competitions and win a prize! Host your Derby Party at the track by contacting Group Sales at mpgroupsales@monmouthpark.com or 732-571-5544 to reserve a picnic area or private event space. Warm weather is right around the corner and nothing signifies the approach of summer like Opening Day at beautiful Monmouth Park. Continue the tradition and celebrate racing's return to the Shore PLUS Kentucky Derby Day. Check out Monmouth Park Racetrack on Facebook and Instagram. Monmouth Park Racetrack has been a staple in the community since 1870. Many changes have occurred in the racetrack's almost 150 years. Monmouth Park Racetrack is constantly growing and changing to accommodate the thousands and thousands of guests that come annually. 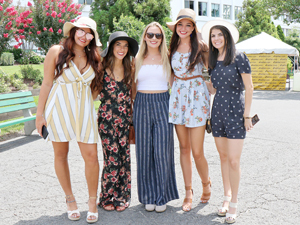 Today, Monmouth Park Racetrack offers casual concessions to upscale dining, bars, plenty of events, and of course the best horse races all conveniently located at the Jersey Shore.